Public health emergencies, including infectious disease and natural disasters, are issues that every community faces.To address these threats, it is critical for all jurisdictions to understand how law can be used to enhance public health preparedness, as well as improve coordination and collaboration across jurisdictions. As sovereign entities, Tribal governments have the authority to create their own laws and take the necessary steps to prepare for and respond to public health emergencies. Thus, legal preparedness for Tribal governments is crucial to public health response. There are 573 federally recognized Indian Tribes in the United States, each of which is a sovereign entity with authority to create laws. 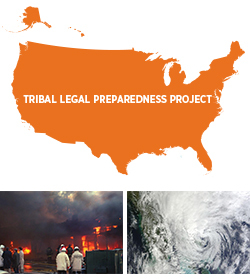 The Tribal Legal Preparedness Project (TLPP) has been established to assist Tribal Nations interested in expanding their legal preparedness capacity. The contents of this website have not been formally disseminated by the Centers for Disease Control and Prevention, ChangeLab Solutions, and the Center for Public Health Practice. The contents should not be construed to represent any agency/organization determination or policy. These website materials are for instructional use only and are not intended as a substitute for professional legal or other advice. While every effort has been made to verify the accuracy of these materials, legal authorities and requirements may vary from jurisdiction to jurisdiction and change over time. Always seek the advice of an attorney or other qualified professional with any questions you may have regarding a legal matter.